We have teachers always looking for new resources and trying to find things out there. A new era has arrived! 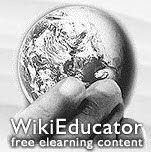 Well, you heard of Wikipedia, now there is WikiEducator. We talk about creating a PLN, well I think Wayne Mackintosh, the creator, is on to something here. He has started a community for planning of education projects linked with the development content for FREE. He has opened up the Open Educational Resources (ORE) for creating free learning for all students worldwide. This would be an excellent resource for our A'o Kumu participants.